The Fascinating History of the links between Harwich and the Continent, Much has happened in the Ports history over the last one hundred years, here details some of the ships or today known as ferries which served the various routes from Parkeston Quay to the Continent. The Great Eastern Railway, which was formed from the merging of the Eastern Counties Railway and the Eastern Union Railway in 1862 operated passenger steamers across the North Sea from Harwich to Europe. By 1872, shipping trade had increased so that more capacity was required and the Great Eastern Railway obtained permission to reclaim land at Ray Farm, a mile to the west of Harwich, and build a new quay. The Chairman of the Great Eastern Railway Company, Charles Parkes Officially Opened Parkeston Quay on the 15th February 1883. The Port had its own railway station, and a hotel was built between the northern platform and the quay, the hotel building is now used as offices. 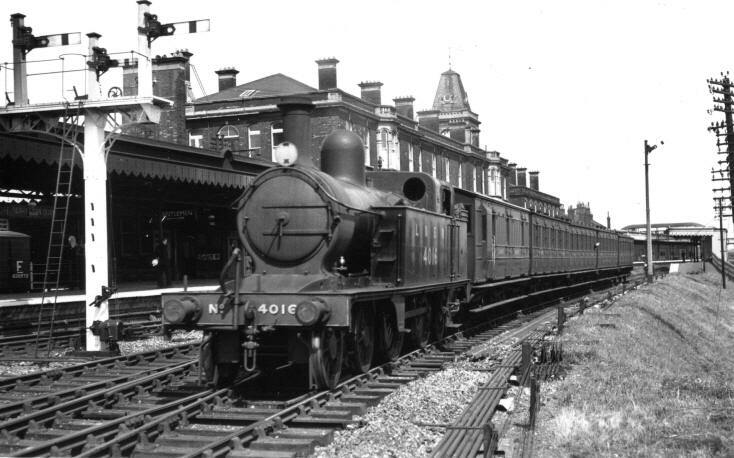 The railway station was originally called Parkeston Quay. which was changed to Harwich Parkeston Quay in 1934 when the new Parkeston Quay West station was opened to service operations at the west end of the quay and it was changed to its current name Harwich International in 1995. It provided berths for six vessels, plus two large warehouses, the quay had its own Railway station, and Hotel as well as it’s own electricity. 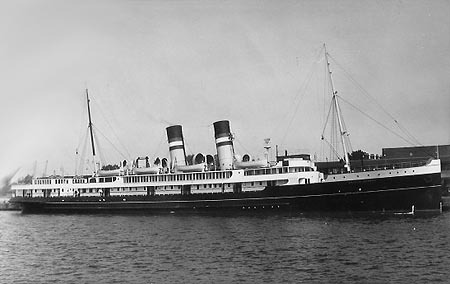 The Great Eastern Railway Company provided a nightly passenger service, Between Parkeston quay and the Hook of Holland and Antwerp, The General steam navigation company operated a twice weekly passenger/cargo Service to Hamburg, whilst the united steamship company maintained a twice-weekly Service to the port of Esbjerg. The Great Eastern Railway in 1863 obtained parliamentary powers to own and run steamships, It began in October 1863 with chartered vessels running cattle and general cargo to the Dutch port, the first vessels built for the G.E.R. being the trio Zealous, Harwich and Rotterdam in 1864. A service to Antwerp began in July 1882, consequent on the opening of the St. Gotthard rail tunnel which opened up new passenger and cargo trade through to Italian cities. Of the early vessels which did not survive to the 1923 grouping, four are perhaps worth mentioning. The paddle steamer Richard Young (1871) became the first vessel to enter the New Waterway on its inauguration on 9 March 1872. p.s. Claud Hamilton joined the GER fleet in 1875 and set new standards of speed and comfort. 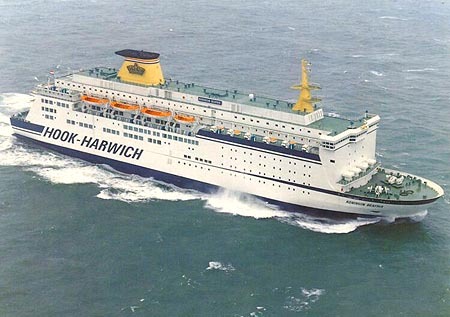 her 22 years in GER service did much to enhance the popularity of the Harwich continental services. p.s. Princess of Wales was launched and delivered by the London & Glasgow Engineering & Shipbuilding Co in 1878, she was an iron paddle steamer with three masts, and was licenced to carry 580 passengers with berths for 111 in first and 77 in second classes. she sailed between Harwich and Rotterdam but later used the new quays at Parkeston and the Hook of Holland. After a useful and uneventful career of 18 years she was sold for scrap on 16 may 1896.
p.s. 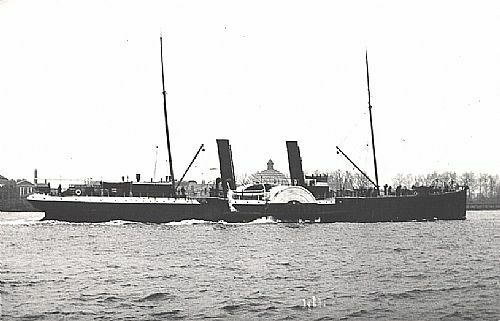 Lady Tyler was launched at T&W Smith’s North Shields shipyard in spring 1880, she could carry some 700 passengers in first and second class and her main saloon was 40ft in length, after a short career of 13 years she was sold in 1893. 1880 the GER ordered its last paddle passenger steamer Adelaide, a handsome two deck steamer with well-raked funnels and was the first steel ship in the GER fleet. 113 first class berths and 58 second with a total capacity of 682. Norwich was the first of the new ships to berth at Parkeston Quay, launched on the 6th of March 1883, followed by her sister Ipswich on 21 May. representing a major advance over the paddle steamers both in design and efficiency, the two ships had first class accommodation for 84 passengers and 32 second class passengers. The two sisters were generally employed on the Antwerp service until their 22 year service ended in 1895 and Norwich and 1905. The long awaited railway arrived at the Hook of Holland on 28th May 1893 and on the previous day over a hundred Press gathered at Parkeston quay after their arrival by train from London Liverpool Street. They were shown aboard the new Chelmsford which shortly afterwards embarked on a 6 hour cruise and could not have failed to impress with her interior which was finished in maple and satinwood. 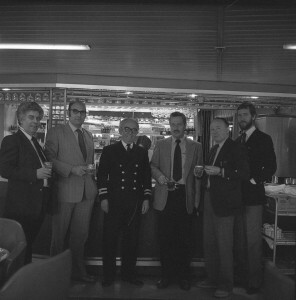 On the return to Parkeston quay, the GER continental traffic manager invited all the crew to join him in a Celebration dinner. 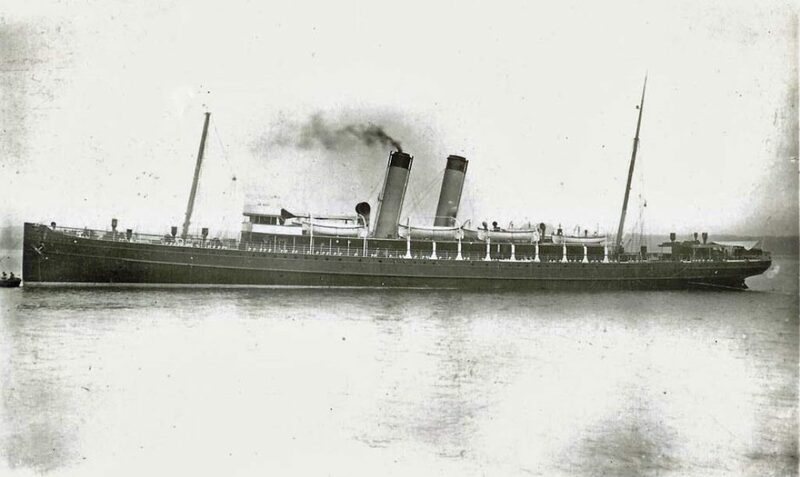 On a sadder note, the fine steamer s.s Berlin (1894) was tragically wrecked on the northern pier while entering the New Waterway in a north-westerly gale on 21 February 1907, only 15 lives being saved and 128 lost in the worst peacetime disaster so far on the North Sea routes. The Yarmouth was the route’s mystery ship. on the 27th of October 1908 she left the Hook of Holland under the command of Captain Avis at 10.30 with 430 tons of cargo and one passenger who could not have enjoyed the rather Spartan atmosphere experienced on board. The Yarmouth was last seen passing the Outer Gabbard light vessel listing badly but not enough for her Master to call for assistance. Just what happened is not known suffice to say that the ship was never seen again. After she failed to arrive at Harwich. The next morning Vienna set out to look for the vessel Only to find wreckage.21 crew and one passenger all perished. J.C. La Cour at 1,615 gross tons, the 112 passenger vessel was the first Dfds North Sea passenger steamer to be built in Denmark and the first specifically designed for the Harwich service. her speed was 16 knots, she entered service on the Esbjerg route in August 1901. In January 1902 the company would take delivery of two new vessels Cromer a cattle/cargo steamer of 800 tons gross for the Dutch service, Brussels at 1,380 gross tons on the Antwerp service. Cromer was so successful that she would be joined by three sisters Yarmouth, Clacton, and Newmarket. 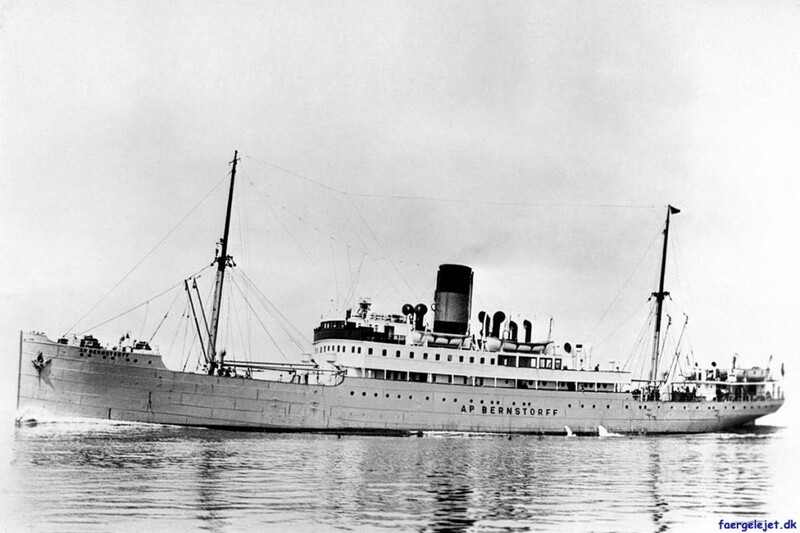 A new service operated by Thule line was introduced with the arrival of Balder on the 7th May 1910, renamed Northumbria in 1938 she was re-instated at Harwich in 1940,before being seized by German forces in Norway and eventually being bombed and sunk in 1943. along with Saga which was the last passenger steamer built for Thule Line before the Swedish Lloyd taker over in 1916. Earl’s last passenger vessel for the Great Eastern Railway was the Dresden of 1897. She was launched in November and boasted a higher bridge than the previous ships. She has gone down in history as the ship which the world-famous German marine engineer Dr. Rudolph Diesel. On the evening of September 29th 1913, Diesel boarded the steamer in Antwerp on his way to a meeting of the Consolidated Diesel Manufacturing company in London. He took dinner on board the ship and then retired to his cabin at about 10 p.m., leaving word to be called the next morning at 6:15 a.m. His cabin was found empty during a roll call, and he was never seen alive again. A search of his cabin revealed that Diesel’s bed had not been slept in, although his nightshirt was neatly laid out and his watch had been left where he could see it from the bed. his hat and overcoat were discovered neatly folded beneath the afterdeck railing. Ten days later, the crew of the Dutch boat Coertsen came upon the corpse of a man floating in the ocean of the North Sea near Norway. The body was in such an advanced state of decomposition that it was unrecognizable, and they did not bring it aboard. Instead, the crew retrieved personal items from the clothing of the dead man, and returned the body to the sea. On October 13, these items were identified by Rudolf’s son, Eugen Diesel, as belonging to his father. 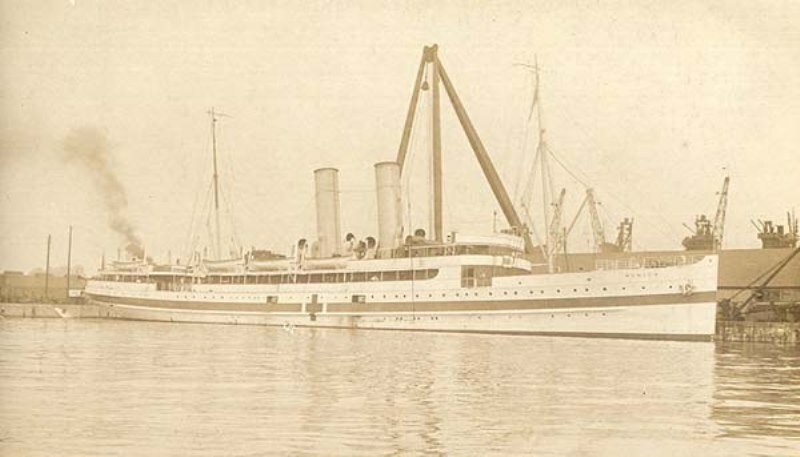 The United Steamship Company decided to build a motor driven passenger vessel A.P.Bernstorff arrived at Parkeston quay on her maiden voyage on the 11th of august 1913 ,The new ship was powered by two six cylinder engines producing a speed of 15 knots and with a cargo capacity of 88,000 cubic feet. accommodation was for 134 first class 68 second 220 third class, she was laid up and sold for scrap in June 1967. m.v Jyland arrived Parkeston quay on her maiden voyage on 28th June 1926.
mv Esbjerg on 3rd may 1932, Droning Maud spent several years on the Harwich run in the 1920’s, she served for a while as a German troop transport in World War 2 before returning to the North Sea, before being sold to Finland, in 1947 she sailed the Baltic waters until broken up in 1967 at the age of 61. World War I was declared on the 4th of August 1914 and services to Esbjerg, Hamburg and Gothenburg were suspended. On the 11th Dec 1914, the Colchester was ordered to stop by a German submarine which has surfaced alongside; Captain Lawrence duly ordered ‘Full Ahead’ and his ship outran the sub. He was later awarded a gold watch by his employers and stated that he had previously been involved in six similar escapes. The War had cost six of its eleven ships new ships were purchased. 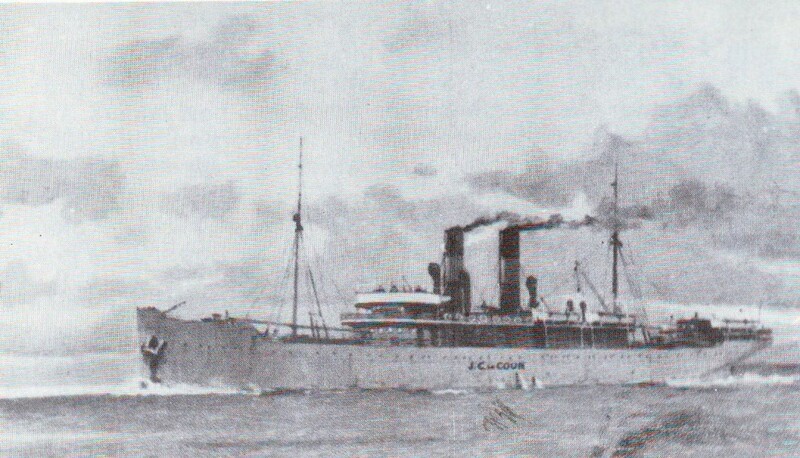 St George, Kilkenny and Felixstowe, the later would join Cromer on the Rotterdam cargo service in 1919, whilst Amsterdam (1) and Archangel would Re-open the Hook of Holland passenger service St Denis was the last G.E.R ship to return from war duties, she was then placed on the Hook of Holland route in December. In June 1920 G.E.R ordered three new ships for their Antwerp service Antwerp, Bruges and Malines as passenger traffic increased they introduced A thrice weekly summer service to Zeebrugge with a 4th vessel Roulers (Ex-Vienna). On the 1st of January 1923 the amalgamation of G.E.R led to the formation of the London and North East Railway Company with the first North Sea vessel the 1,088 ton Sherringham. St Denis. built in 1908 by John Brown and Company at Clydebank as “Munich” for the Great Eastern Railway for service on the Harwich – Hook of Holland route. Requisitioned during the First World War for use as a hospital ship and renamed St Denis. acquired by LNER in 1923 and she continued to serve the Hook of Holland route until 1932 when she was relegated to summer secondary services by new buildings on the Hook route,she was employed in evacuation duties at Amsterdam in 1940 when she became trapped and was scuttled. Salvaged by the Germans and served until scrapped in 1950. On 5th July 1921 the Great Eastern Railway commenced a new summer service to Zeebrugge. It was operated three times a week and it was hoped that it would encourage continental holidays which had become very popular since the end of the First World War. Transferred to the route was the Rulers, formerly the 1894 Vienna. 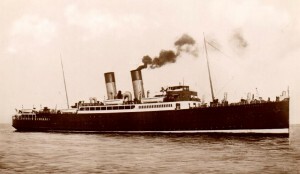 The first LNER new ship was the cargo steamer Sherringham which took up the Rotterdam route in 1926. 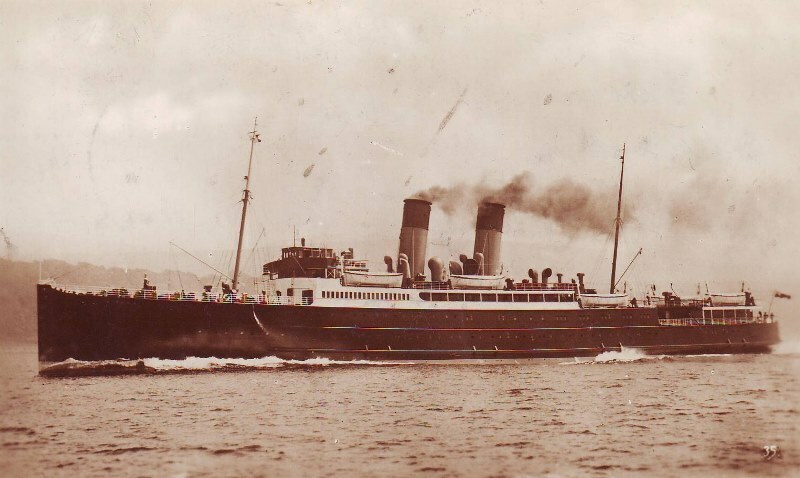 The most significant change in 1926 was when the Zeeland Steamship Company (SMZ) commenced service from Parkeston quay to Flushing, It was the Veteran steamer m.s. Oranje Nassau that arrived from Flushing on the 31st December 1926 in readiness for taking up the service on the following day, while the inward sailing to Harwich was operated by the five year old s.s Mecklenburg. The third of the Dutch trio was the s.s. Prinses Juliana. The L.N.E.R ordered three new ships for their Hook of Holland service in July 1929,the 4,218 t.s.s Vienna, followed by Prague and Amsterdam (2). 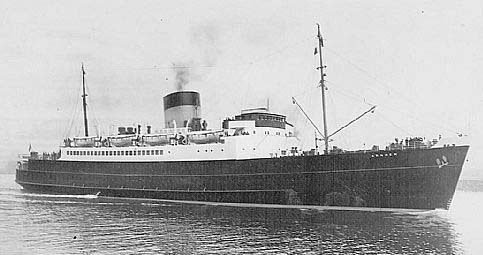 Sister ship to the Prague and Amsterdam, Vienna was largely employed on weekend summer cruises and in 1939-1945 she was used as a troop carrier. She was sold in 1960 for breaking up. Vienna Memories: Dad would take us for a walk up the promenade, we had to stay up to see the s.s Vienna going out and you could hear all the music and the dancing on there. It used to be our Friday night treat. On Thursday 31 august 1939, the Amsterdam sailed from the Hook of Holland for the final time and after the Prague had followed her on 1st September, the service was closed for six years. On the following day Parkeston Quay was requisitioned by the Admiralty and on the 3rd of September the United Kingdom declared war on Nazi Germany. 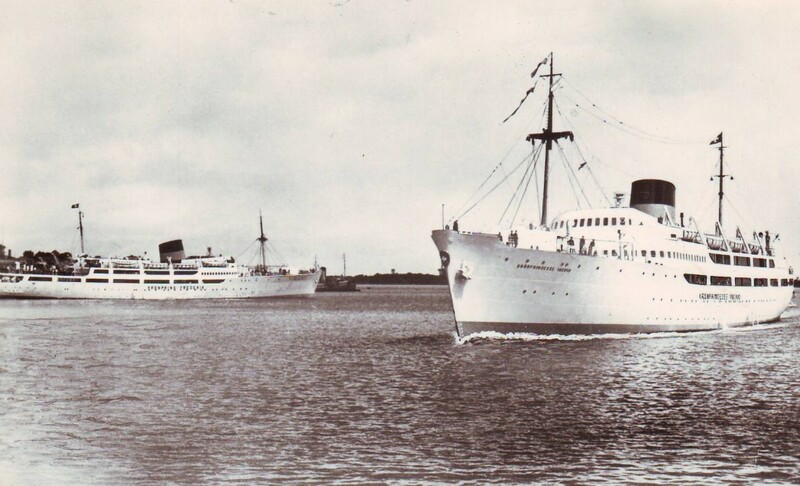 s.s Amsterdam II and s.s Bruges were immediately requisitioned, sailings from Parkeston Quay on the 5th and 9th September 1939, for service ferrying troops from Southampton to Le Havre and Cherbourg. The realities of war hit Harwich on the 19th November 1939 when the Japanese 12,000 ton cargo passenger liner Terukuni Maru hit a mine of Felixstowe in view of Dovercourt prom walkers, all 182 crew and 27 passengers were saved. The wrecked ship rested on its side at 8 fathoms (48 ft.; 15 m) depth. The wreckage was examined for salvage potential, but salvage work was not undertaken. In 1946 the ship was demolished with explosives as part of a British effort to remove war debris from coastal waters. Her sinking has been described as Japan’s only World War II casualty outside of East Asia before the 1941 attack on Pearl Harbor. In May 1940 Malines and St Denis were sent to Rotterdam to evacuate British civilians and both were caught in the port when the Germans arrived. The crew of the St Denis scuttled her where she lay, while the Malines sailed in the dark along an unlit river and beneath enemy guns with her 2000 passengers. The Malines made several mercy trips to evacuate troops after Belgium was overrun; she saved 100 men from HMS Grafton during the evacuation of Dunkirk. Archangel evacuated troops from the beaches while under fire, and in May 1941 whilst on passage between Kirkwall and Aberdeen she was attacked and sunk off the Scottish coast with the loss of seventeen lives. 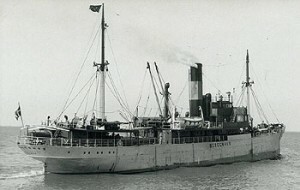 The new motor ship Koningin Emma escaped to England on 10th May 1940. Renamed Queen Emma by the Royal Navy, and during 1942 took part as landing vessels for the commando raids. On 6th of June 1944 came the D-day Landings, when the Queen Emma together with the Mecklenburg formed part of the invasion fleet in the liberation of Europe. It was not until early 1947 that SMZ finally decided that their future lay at Hook of Holland, although the Dutch Government thought otherwise and these differences of opinion remained until 1953. After that she returned to Flushing at 29-4-1946 where she was converted as ferry in civilian service with a capacity of 1423 passengers in day service or 203 1st class and 94nd class. The sea trials took place on 28-2-1948 and the maiden voyage at 5-3-1948 from Hook of Holland to Harwich. In the summer of 1948 the ship was chartered by Batavier Line for the route Rotterdam-London. 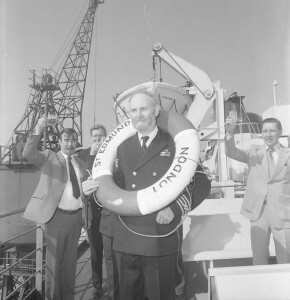 The ship was towed to Antwerp in December 1968 for breaking. With German forces moving westward ss. 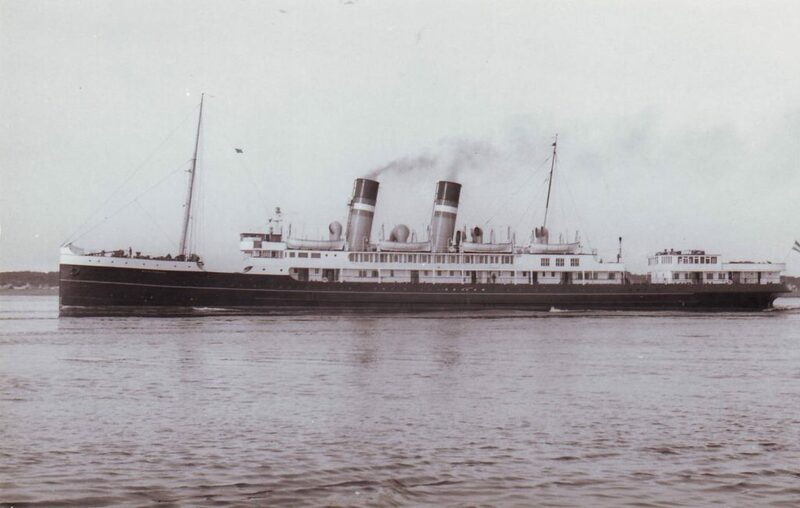 Malines and s.s St Denis sailed to Rotterdam on 10 may 1940, to evacuate Remaining British subjects. 16 May 1941 s.s Archangel was bombed. The ship was severely damaged but taken in tow, beached but declared a total loss, 17 crew lost their lives. During June 1944 s.s Amsterdam II was sent to Glasgow for a four week conversion to a Hospital ship in readiness for D Day landings, This ship was the last merchant ship that left Le Havre, before the enemy blew up the town. In June 1944 the Amsterdam was rebuilt as a hospital ship. on the 7th August 1944 she was mined on the second trip as hospital ship near the French Coast with heavy loss of life. After The Second World War. The Esbjerg service was re-opened with the arrival of the m.v. Parkeston on the 6th December 1945, the service was weekly from Parkeston Quay on Saturdays and from Esbjerg on Wednesdays. 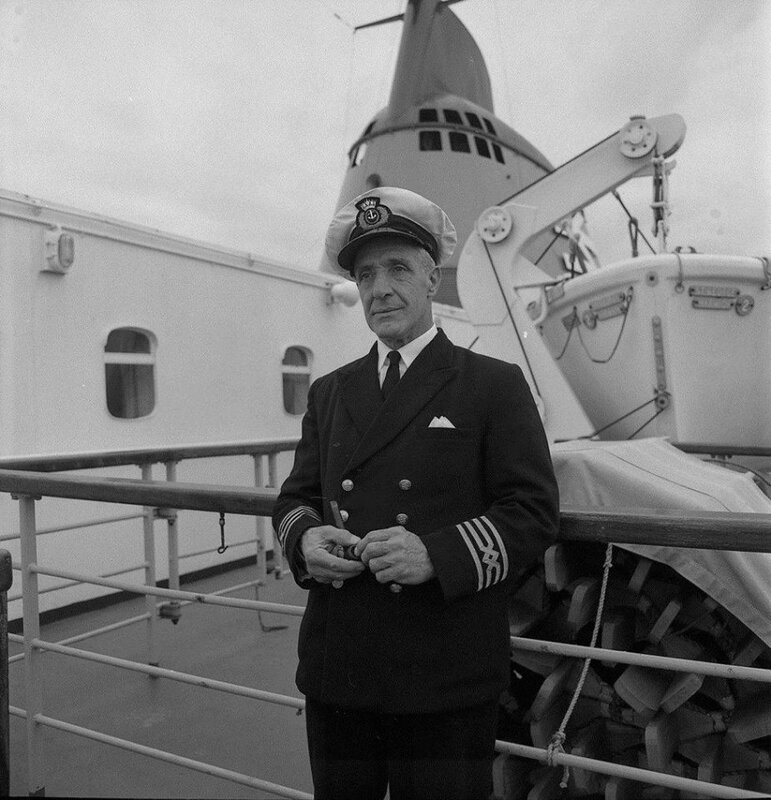 A.P.Bernstorff assisted on the route after the war until 1947 when she hit a mine severely damaging the stern and steering gear, there were no casualties. After the war in Europe was over. Queen Emma and the Princes Beatrix sailed to the far east where they landed French troops near Saigon, after six years of wandering the oceans, both Dutch ships retuned to Flushing undamaged and unrecognisable. It was not until 31st MAY 1948 that they were to return to civilian service operating the between Hook of Holland and Harwich. June 1946 Accrington and Dewsbury commenced a twice weekly Service with sailings on Tuesday and Fridays from Parkeston Quay to Antwerp and from 1948 Monday, Wednesday, and Friday at 1800, crossing time was 14 hours. Built in 1910 the Humber ships were described as luxury floating palaces,accommodation was amidships with a stateroom on the bridge deck, a ladies lounge with mahogany bookcase, a writing table with easy chairs. a smoking lounge with well-equipped bar made the gentlemen’s passage a dream. The cabin de-luxes were fitted with brass bedsteads, porcelain wash stands and armchairs. When off service for overhaul they were replaced by Bury and her sister Melrose Abbey built 1929 with accommodation for 112 passengers. The Prague’s maiden voyage was on 1st March, but five days later dense fog was already interfering with her schedules. 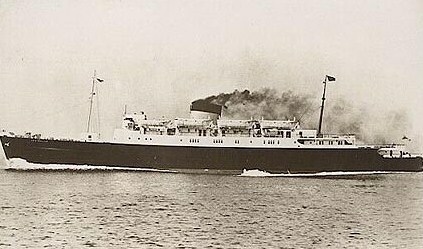 On 1st of September 1939 the Prague went from Harwich to Hook of Holland afterwards the service was to be closed for six years. 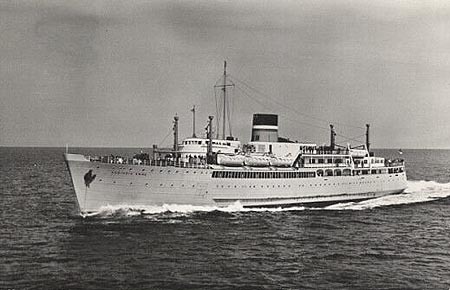 on 14th of November 1945 the Prague reopened the post-war civilian service from Harwich to the Hook of Holland which was then operated on a thrice-weekly basis. In March 1948 fire broke out in the engine room of the S.S. Prague followed by an explosion the vessel heeled over resting on the dry dock wall, the fire left the ship only fit for the scrap yard. The replacement vessel was the m.v Duke of York which was Transferred from Heysham to operate the service in May 1948.
m.v. Kronprins Frederik entered service on the 5th June 1946 from Esbjerg. her sister m.v. Kronprincesse Ingrid entered service on 17th June 1949. 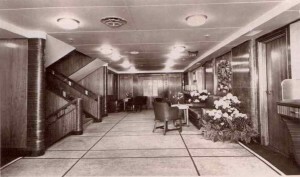 Passenger accommodation was situated on four decks. The 294 Passengers ,148 first-class and 146 third-class, were accommodated in one, two and four-berth cabins. The two 16 cylinder engines produced a speed of 21 knots meaning the crossing time coule be made in 19 hours. Arnhem named after the town of Arnhem, where in September 1944 the 1st Airborne Division resisted the German Army. The design of the new ship was basically pre-war, although built with a single funnel and, in order to pick-up the cruise market once again, she was fitted out as a one-class steamer. During March, April and the first half of May 1954 she was converted to a 2-class vessel, her last call at the Hook of Holland was on the 27th of April 1968. On 6th of June 1944 came the D-day Landings, when the Queen Emma together with the Mecklenburg formed part of the invasion fleet in the liberation of Europe. Mecklenburg was expected to be released by the Royal navy in July 1945, but in the event did not arrive in Rotterdam until November, after which she took up the conclusion she was subject to an extensive refit to prepare her for civilian service, although just when that service that the port of Flushing and its infrastructure were so badly damaged that the service might never return there. 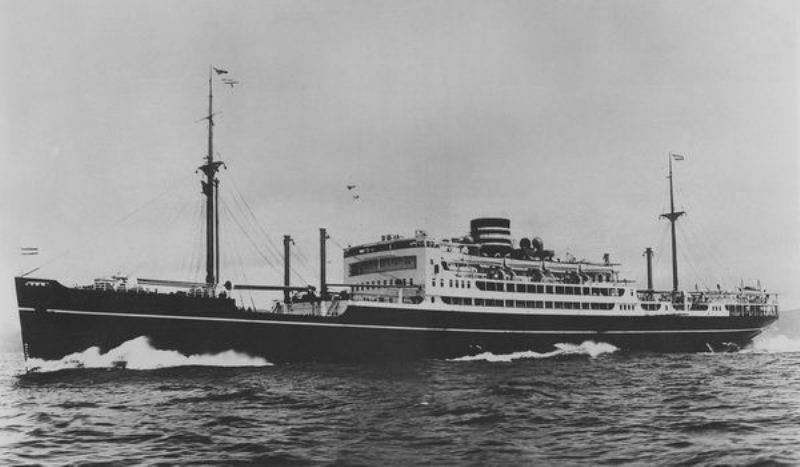 With competition from air travel and outdated ships it was decided to withdraw full passenger’s facilities from the Antwerp route on 1st February 1951. Dewsbury was reduced to cargo with accomodation for 12 passengers sailing Mondays and Thursdays from Parkeston Quay, and Tuesdays, from Antwerp. Accrington was withdrawn may 1951 arriving at dunston for breaking up, With the coming of new ISO containers it was decided to drop Antwerp in favour of Zeebrugge. It was not until early 1947 that SMZ finally decided that their future lay at the Hook of Holland, although the Dutch Government thought otherwise and these differences of opinion remained until 1953. 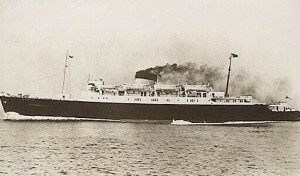 The Mecklenburg was retired on the 25th October 1959 and three days later she sailed to Schiedam for lay-up pending sale. on 15th of May the following year this splendid vessel arrived at Ghent, Belgium for breaking. May 29th 1950. With sirens hooting a welcome from ships large and small in Harwich harbour and at Parkeston Quay the new British Railway’s vessel Amsterdam sailed majestically into Harwich harbour on Monday morning, her new paint glistening in the sun. She had been taken over on the Clyde by the Marine Superintendent, Capt. R. Davis, after very successful trials. A big crowd saw the ship pass through the harbour with her siren sounding. The last word in comfort for passengers and crew, the new ship was is equipped with every modern aid to navigation and control. For the passengers there is attention to detail in cabin furnishing and deck, companion way and saloon spaciousness, which will make the overnight crossing a luxury on its own. The final touch which lifts the ship clear of any austerity is to be found in four “cabins de-luxe”, each with two beds and a bathroom, and each decorated in a distinctive colour-scheme – red; pink and silver; blue and white; and green and brown. The crew. as well as finding the ship “easy-working” , due to her spaciousness and the convenience of well-thought out fittings, are pleased with their own quarters, Ventilation and crew’s quarters are a great improvement on those in other ships on the Harwich-Hook service. Proposing good fortune to the Amsterdam, Captain P.D.H.R. Pelly, D.S.O.,R.N., senior officer, Reserve fleet, Harwich, said it was appropriate the he, as a naval officer, should have had the honour. Merchant ships were an essential part of our life in peace and war, and the task of protecting them was undertaken by the Navy. He wished success to the Amsterdam and all who sailed in her. On 30th May 1959 the new; futuristic-looking ship was launched by HM Queen Juliana and christened Koningin Wilhelmina. she was to be the first ship specifically designed for the link to be fitted with stabilizers and a bow-thrust unit for manouvering at slow speeds in confined spaces. The new ship could produce a speed of 23.5 knots she had a capacity for 200 tons of cargo and a passenger certificate for 1600 in two classes. 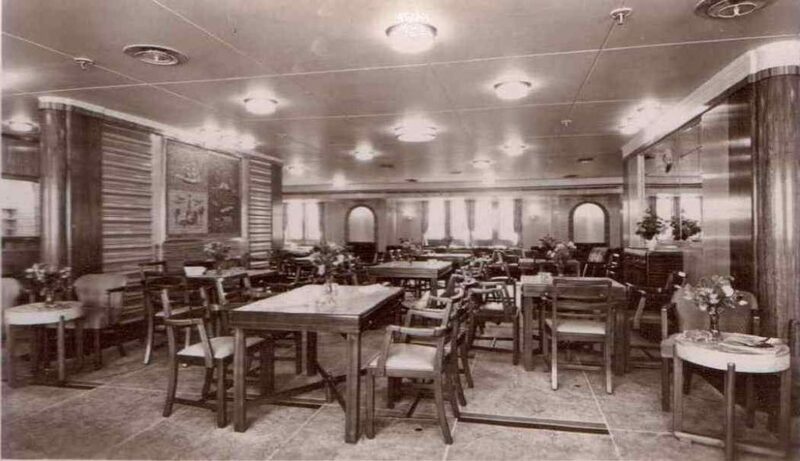 For first class passengers a spacious observation lounge was located under the bridge giving a splendid view at sea. on the boat deck was ten Cabin de-luxes all fitted with ship to shore telephones. 28th June 1978, the 6,228 ton vessel sailed from Parkeston Quay for the last time after 18 months lay up in flushing she was sold to for service around the Greek islands. British rail introduced the last new conventional ferry in July 1963, the 6,584 ton Avalon (2) entered service on the Hook of Holland route. 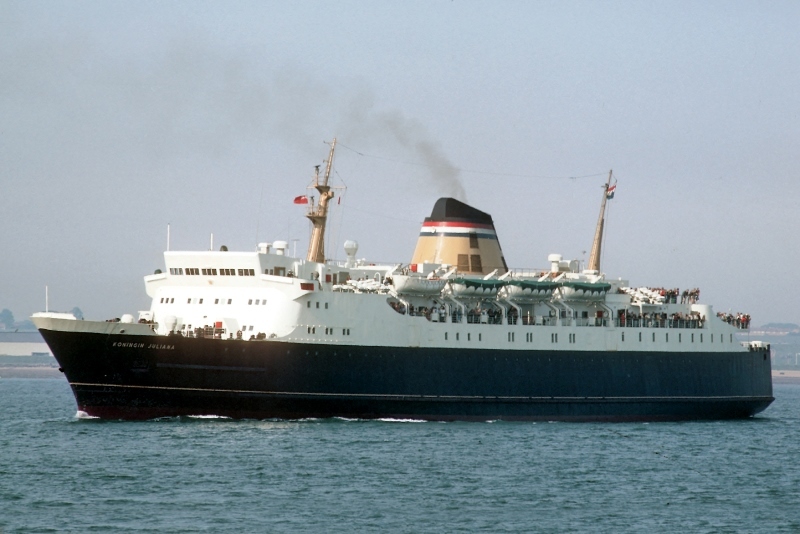 The vessel could carry 750 passengers, Luxury facilities included, a dining room and cafeteria which served a wide variety of meals and refreshments she was the first vessel in the Harwich fleet to be fully air conditioned and the first to be fitted with stabilisers. in the spring and autumn she was used as a cruise ship. Her final sailing from Harwich was on the 29th December 1974. 1964 saw the introduction of the first Ro-Ro passenger ferry, when m.s. England entered service on a route connecting Esbjerg to Harwich. The United steamship company (now D.F.DS.) Introduced the side loading 8,117 ton car ferry in June 1964. this was the first drive-on, drive-off North Sea ferry, she had side loading doors with head room for private cars and small caravans only. Car deck accommodation was for 100 cars. Passenger facilities were for 467. In 1970 England became a one class ship and in 1972 the cargo space was reduced and her accommodation increased to 668. 1964. Zim Israel Navigation Company commenced a weekly service from Parkeston Quay to Hamburg. The Dutch coaster m.v. 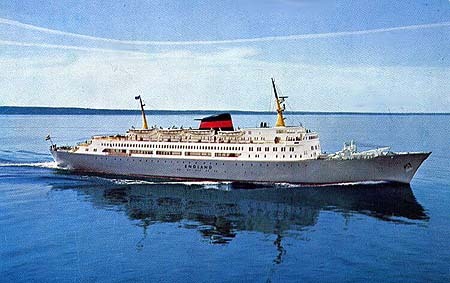 Deo Gratias was chartered, built in 1953, of 398 tons. The service arrived at the Quay on Monday morning and departed on Tuesdays. Zim later joined forces with the star shipping agency, traffic increased slightly but Closed after only 10 months. In 1965. 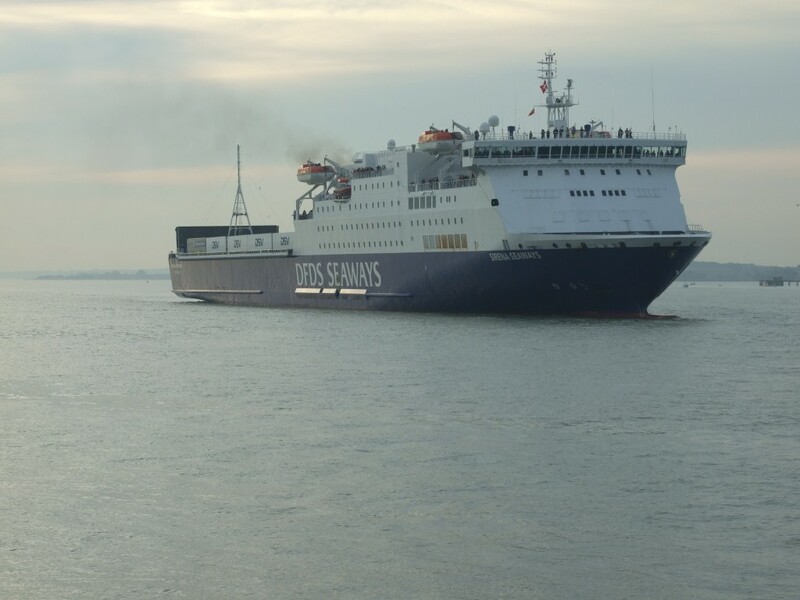 90,000 Passengers and 15,000 cars travelled between Harwich and Esbjerg, a new ship was ordered m.v. Winston Churchill was named at Greenwich by baroness Spencer On the 30th May 1967 and she completed her maiden voyage on 2nd June 1967 and became the first ship to use the new newly completed west portal berth at Parkeston Quay .with full roll-on, roll off facilities. The car deck could accommodate 180 cars or 40 20-feet trailers or a mixture. The 24th May 1966. £3 million pound Prins Hamlet arrived at the new pontoon at Parkeston Quay, with stern and bow doors for loading a maximum of 300 cars or 26 Lorries, facilities included cabins with shower and toilets, a night club, restaurant with a’ la carte menus, a cinema, sauna and swimming pool. The 16 hour. voyage to Bremerhaven departed every other day from each port sailing at 17.00. From 1st January 1969 until 30th April 1979 Prinz services transferred to Navyard Wharf. On 19th May 1967, Fred Olson Lines. m.v Black Prince docked at the newly completed East Portal Berth and opened the new service to Norway. she was built in 1966 by the Lübecker Flender-Werke in Lubeck, West Germany for Fred Olsen Lines for combined ferry/cruise ship operations. 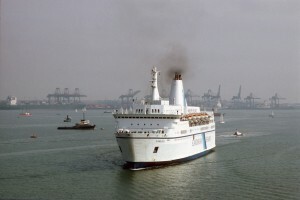 from 1970 until 1983 she sailed the northern hemisphere summer seasons on ferry service for Det Bergenske Dampskibsselskab as Venus, while returning to cruise service with Fred Olsen for the winter seasons. In the winter months she sailed to the canaries under the name m.v Venus, all cabins had private shower and toilets, a night club was situated on the lounge deck aft, and the 9,500 ton vessel had a passenger certificate for a Maximum of 591 passengers. Sailings where on Mondays, Saturdays and Wednesdays. in 1986 Fred Olsen bought the ship outright and she was converted to a full-time cruise ship, retaining the name Black Prince. 9th June 1967 m.v Stafford arrived at Parkeston Quay for the first time, 2,602 tons ro-ro freight ferry with space for 113 trailers Over 2 decks. Passenger accommodation was limited to 12 drivers. 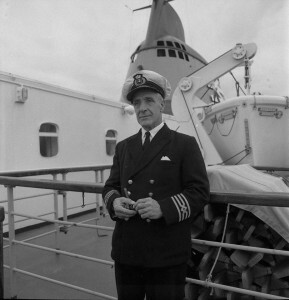 29th May 1968 Belgium Marine Administration’s, m.v. Roi Baudouin berthed at Parkeston Quay opening the new link with Ostend, the service was daily, leaving Parkeston Quay at 21.45 in the summer and 22.30 in the winter months, at 3241 tons, built 1962 accommodation was for 850 passengers and 160 cars. Other ships used on the route. 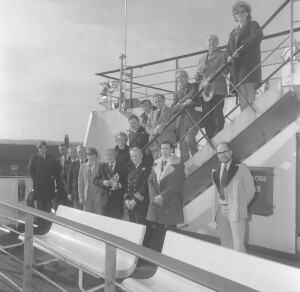 Artevelde, Koningin Fabiola, Princesse Astrid, Prinses Josephine Charlotte, Roi Leopold III (1956) made one trip in 1969. The main similarity to the earlier Belgian car ferries was the low headroom vehicle deck which precluded the carriage of freight. Bow doors were also omitted, therefore adding to turn around times. The fact that R. M. T. could not envisage the explosion in lorry traffic was embodied in the design of the Princesse Astrid and Roi Baudouin. They were beautiful ferries but comparatively obsolete within a few years of entering service. From 1970 the service became summer only arriving Parkeston Quay at 13.45 and sailing at 1530. 10th September 1973 m.v. Roi Baudouin sailed from Parkeston Quay for the last time and therefore closed the short lived Service. The container terminal was opened on the 21st may 1968 by Princess Alexandra. 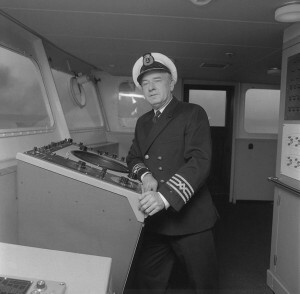 The service started with the Dutch ships m.v. Domburgh & the m.v Nassau on the Rotterdam service, The Zeebrugge services departed Parkeston Quay at 23.00 hrs. Sunday – Friday and 1700 Monday – Friday. 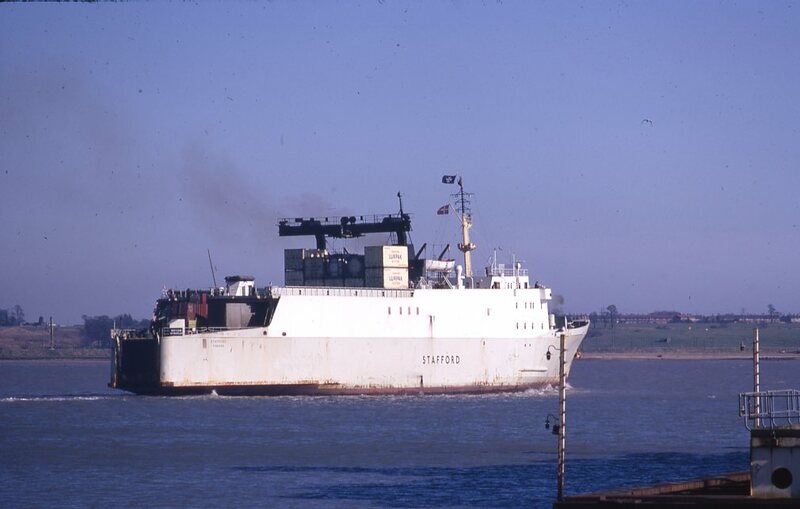 whilst the Zeebruge service used the British Rail vessels m.v Colchester and m.v Isle of Ely which had been converted from general cargo to containerisation. The Rotterdam link was closed in 1973. The 17th of March 1968 saw the arrival of the first of two new container ships m.v. Seafreighliner I and followed by her sister m.v. Seafreightliner II. the Sea Freightliners were steam-ships with aft superstructures and aft arranged machinery. each of four cargo holds with two hatches that cellguides had for the inclusion of 30 foot long Iso containers, consecutively in two pairs, five rows across and three layers of each other were impounded. 110 30-Foot units could be placed below deck, on the deck, there were 38. On the deck, instead of 20- and 40-foot containers could be blocked. Such was the success of this service, that in its first year of operation 21,000 containers Were shipped to zeebruge with both vessels each doing a daily Harwich-zeebruge return trip. The service ceased to operate in December 1985. 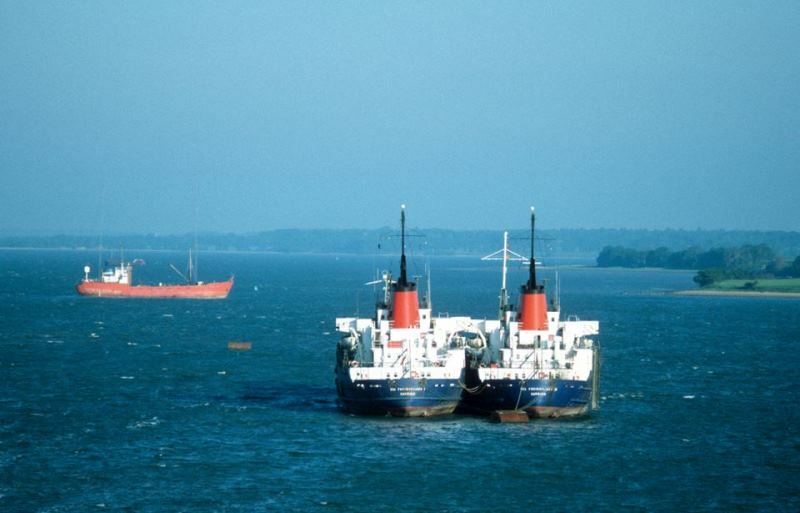 The two ships served the Harwich-Zeebrugge container service of the British railways Board, the ships were operated, temporarily imposed on August 16, 1986 on the River Blackwater in Essex, and in 1987 finally sold for breaking in Asia. The m.v. Colchester was lengthened by 54 feet and was introduced as a replace for the Ely Capacity was now 54 20 ft. containers in the holds with space for 22 on deck. m.v. Isle of Ely made her last two commercial voyages from Harwich to Dunkirk in November 1975 Before moving to barrow to await a buyer. 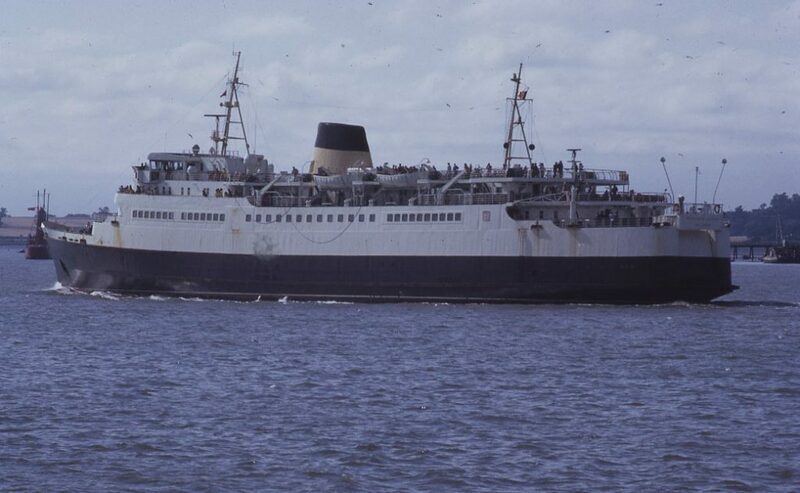 During 1969 S.N.C.F opened a new ro-ro service from Dunkirk – Parkeston Quay the service was initially thrice-weekly, later becoming five times a week arriving Parkeston Quay 2300 and sailing at 0500 m.v Brathay Fisher was taken on a bare boat charter and made three sailings a week between Parkeston Quay and Dunkirk, She was replaced in 1973 by the m.v. Rhodri Mawr, at the end of 1975 Trans Container 1 ceased on the route and in January 1975 opened a new link from Dunkirk to Felixstowe. In 1972 the m.v. Nassau replaced Colchester and Domburgh reducing the service to thrice weekly. The service ceased to operate in December 1985. Wednesday, 18th May 1966 Mr Stanley Raymond, chairman of British Railways board announced plans to completely rebuild the eastern half of Parkeston quay.on the site of number 3 berth a structure was built to enable loading and discharge of roll-on roll-off vessels for. The structure was to be known as the east portal and west portal. Two ships were ordered with bow and stern loading facilities. m.v St George was launched on the 28th February 1968, entering the night service and on the 17th July 1968. 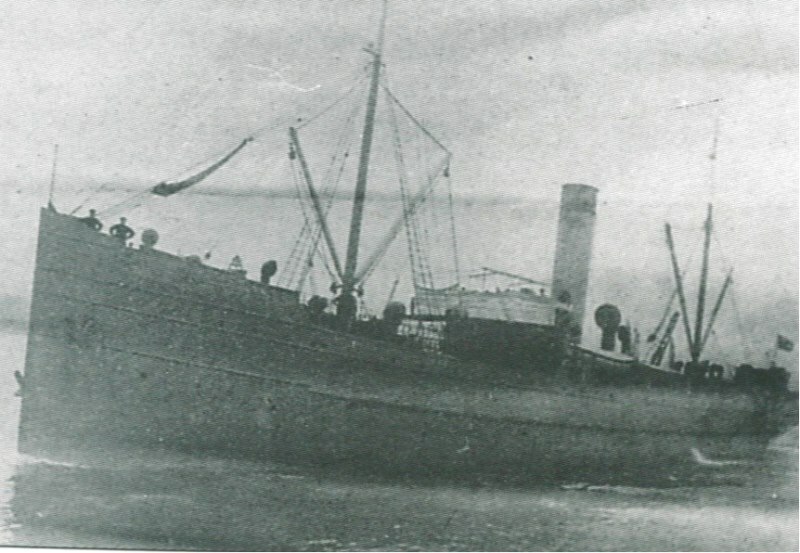 The Zeeland Steamship Company ordered M.v. Koningin Juliana entering the night service on 14th October 1968. 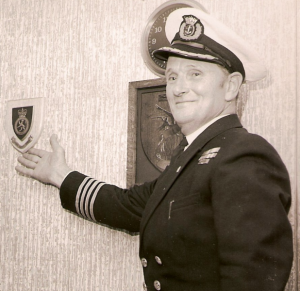 After a running in period on the night service both ships commenced their integrated service on 8th November 1968. Each ship sailed from its home port on the day service returning home on the night service. This fully integrated service was operated from November 1968. 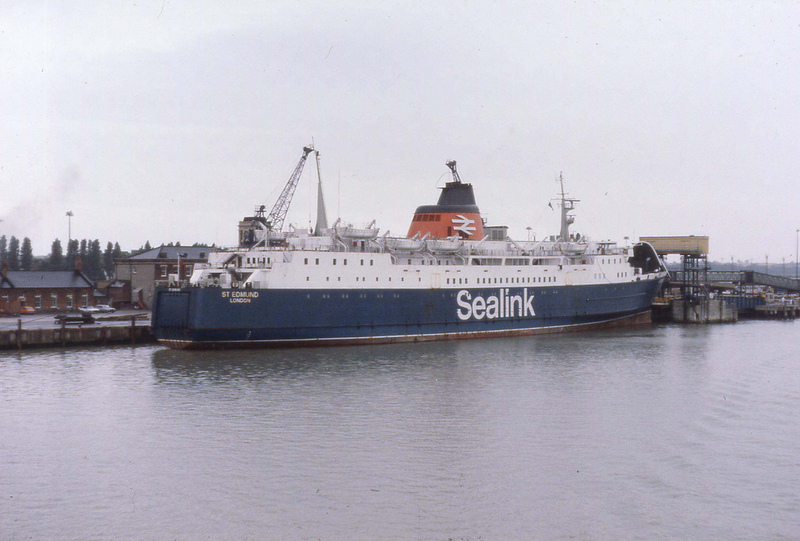 In 1984 Sealink was bought by Sea Containers who continued to operate the British operations under the Sealink name. 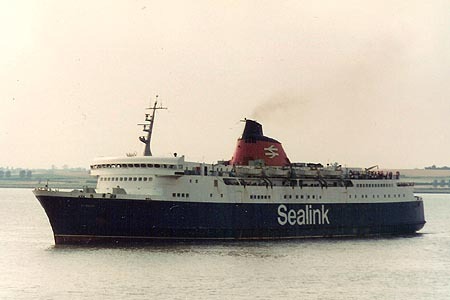 In 1989, SMZ was acquired by Stena Line and in 1990 Stena bought Sealink, thus for the first time, the Dutch and British operations were under the same ownershiper . 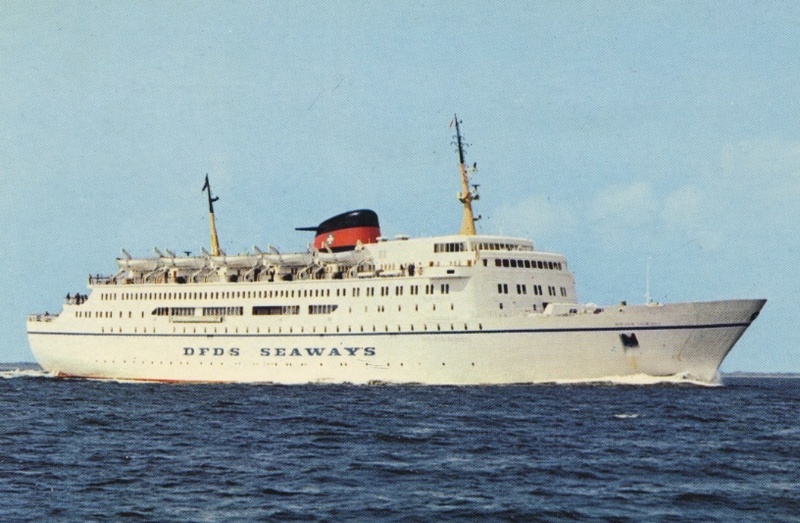 The Dana Regina was ordered in 1969 by DFDS, the oldest operational Danish shipping company. The ship was completed in 1974 and christened MS Dana Regina. 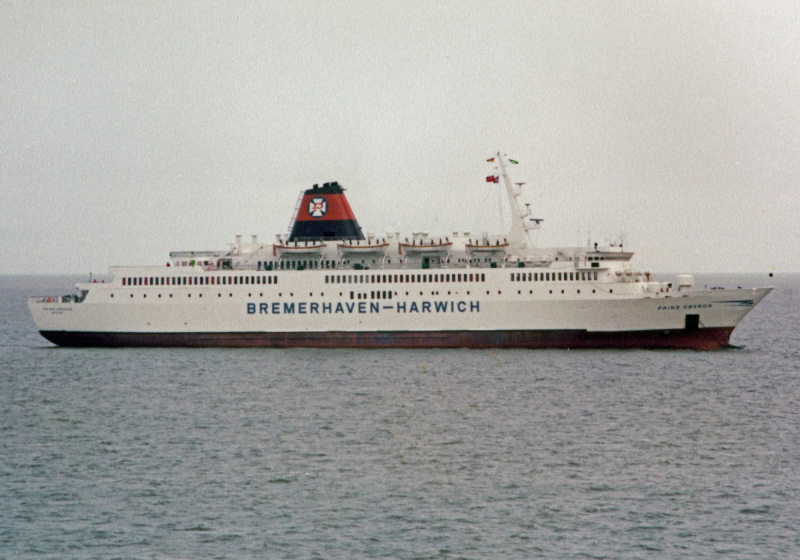 After a promotional cruise from Copenhagen to Esbjerg via Harwich and London she started scheduled service on the Harwich–Esbjerg route on 8 July 1974. In January 1977 the ship was rebuilt at Hamburg, Germany with an enlarged car capacity. In October 1983 the Dana Regina was transferred to Copenhagen–Oslo route. 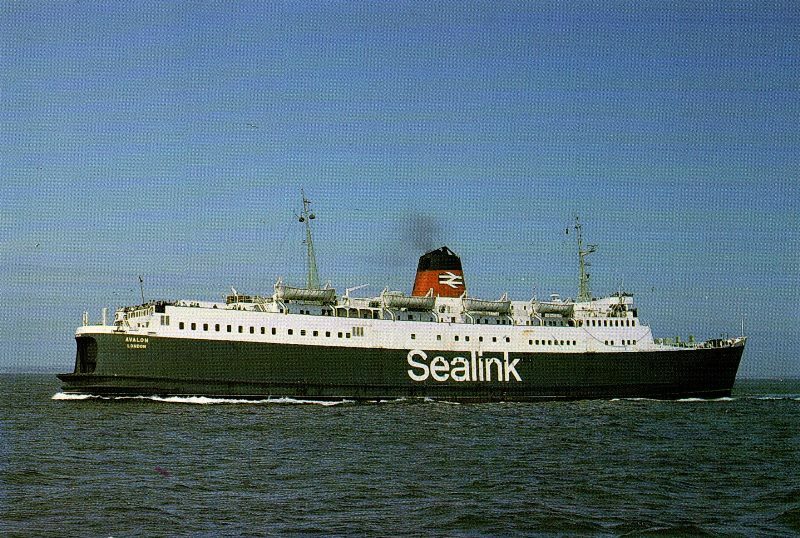 In 1975 SMZ ordered a fourth car ferry for the route. The order was placed at the Dutch shipyard of Verolme Scheepswerf, Heusden and on completion the new ship would replace the final traditional passenger vessel Koningin Wilhelmina. 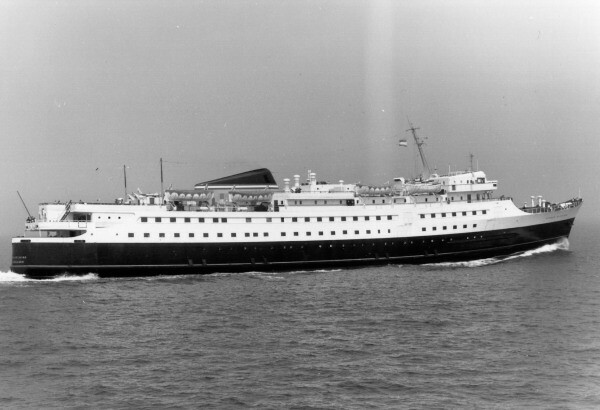 Prinses Beatrix was built with passenger capacity for as many as 1500 in two classes. on the night sailings the number of passengers would be limited to 1024, of which 576 could be accommodated in cabins and 448 in reclining seats. the car deck would have capacity for 320 cars or 44 trailers and 12 cars or a combination of both. She was the largest passenger ship on the route at 9,238 tons, the new ship replaced the Koningin Juliana’s timetable. 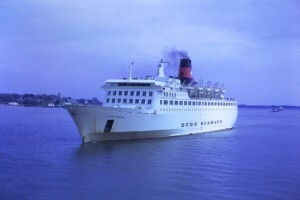 The m.v St. Edmund arrived at Parkeston Quay on Christmas Eve 1974. Capable of carrying 1,400 passengers and cabins for 671 passengers and another 177 in sleeping lounges. built at Cammell Laird at Birkenhead and was notable for her especially impressive interiors, especially in first class. 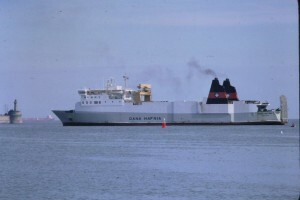 Her reign on the Hook route was not to be long however and in May 1982 the ship was one of various British merchant ships to be chartered by the UK Government for use in the Falkland Islands Task Force. The ship was despatched to Portsmouth for a quick 8 day refit,emerging with a helicopter pad aft in place of her main mast. 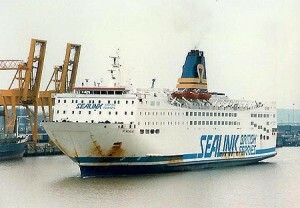 The St Edmund was never to return to service with Sealink. the war actually concluded the day before the ship arrived in the islands and she was employed repatriating defeated Argentinian troops back home and latterly as an accommodation ship in Port Stanley. In February 1983 the ship returned to the UK but was promptly purchased by the Ministry of Defence for more service in the South Atlantic as HMS Keren. This work lasted more than two years, but in July 1985 she returned to the UK and was laid up near Portsmouth for sale. In 1976 the Fred Olson Lines m.v Borgen, 5300 tons built in 1975 took over the Harwich-Norway route with a passenger certificate for 800, the overnight ferry was unsuitable for the 22 hour North Sea crossing. The service only operated once a week on Wednesdays. 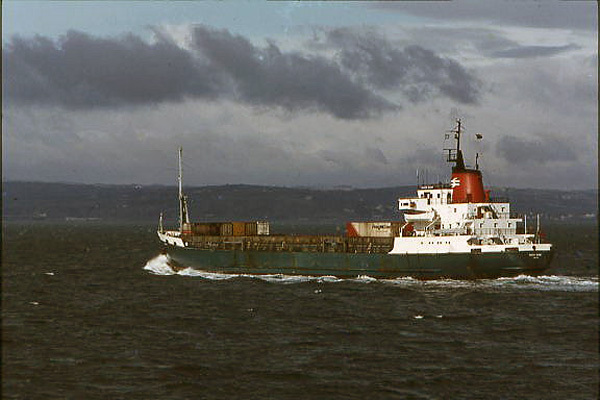 1977 m.v Jupiter, took over the sailing weekly on Mondays with a sailing to Oslo Performed after leaving Kristiansand. 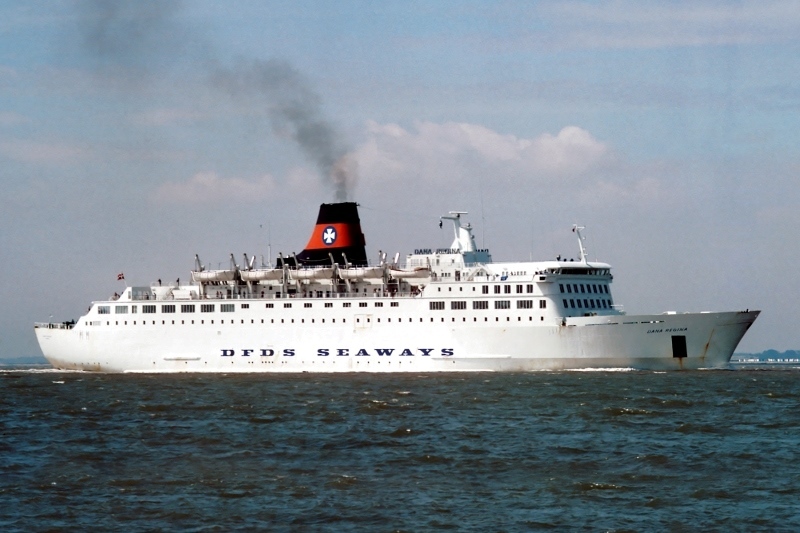 Built at Aalborg Værft A/S in Denmark for DFDS Seaways m.v Dana Anglia entered service on 4th May 1978 named by the Duchess of Gloucester in the pool of London, and Costing 23 million pounds, 14,400 tons she could Accommodate 1249 passengers with a speed of 21.5 knots. 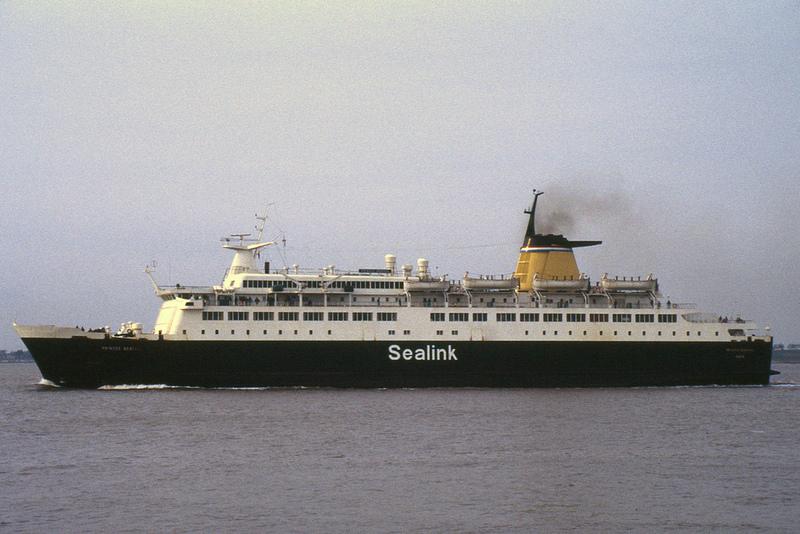 she sailed between Harwich and Esbjerg from 1978 – 2002. the vessel appeared in two BBC TV Series. in 1982–1983 she was the setting for the second and third series of the soap opera Triangle. 1st May 1979. m.v. Prins Oberon docked at the west portal berth at 09.00 to re-open Parkeston Quay’s passenger link with Germany. Built in 1970 of 7,500 tons accommodation for 1040 passengers, Facilities included a 300 seat restaurant, a 62 seat bar saloon, a 250 seat cafeteria, a 34 seat teenager room and a 40 seat conference room. Car deck space allowed 238 cars, or 47 40-feet lorries, with a speed of 22 knots. On 1st September 1981, D.F.D.S. took over Prins Ferries and added the m.v. 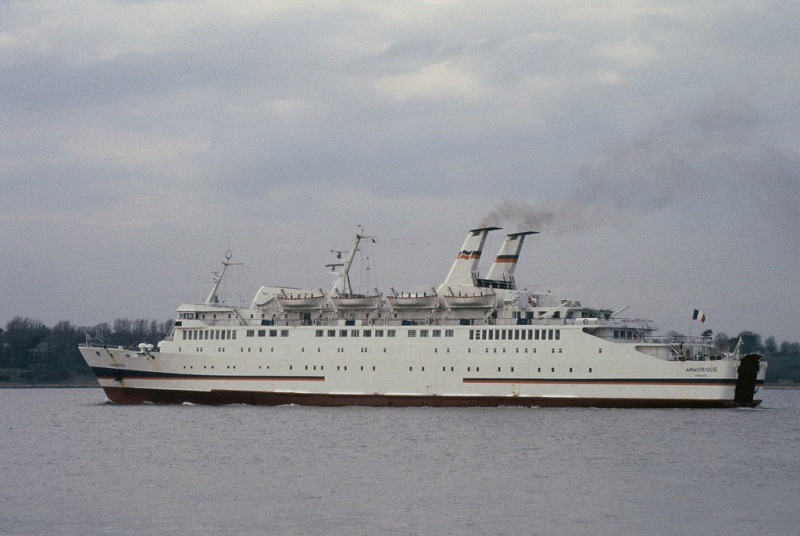 Dana Futura to the Hamburg route making an additional sailing per week, Bremerhaven passenger traffic decreased and the route closed on the 17th December 1982. January 1982 saw the arrival of the chartered 1975 built m.v. 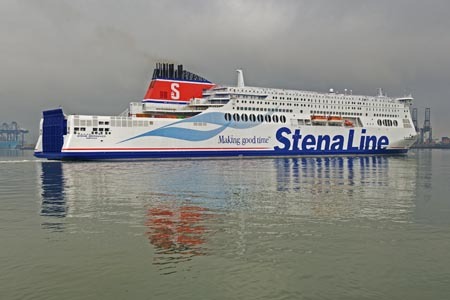 Stena Sailor, 2,353 tons, she could accommodate 35 12-metre Lorries and 100 trade cars on the top deck, passenger accommodation was provided for 12 lorry drivers. She returned to her owners on the 13th august 1982. 1st May 1983. Tor Line transferred its Gothenburg passenger service from Felixstowe to Parkeston Quay. 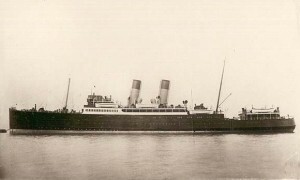 Tor Scandinavia operated the first sailing followed by her sister Tor Britannia. Both ships were built at a cost of £13 million, Accommodation was for 722 cabins with private shower and toilet, a further 512 passengers could be accommodated in couchettes. the vehicle deck provided space for 470 cars or 70 Commercial vehicles or a combination of the two. 10th June 1983 Huge crowds lined Harwich quay to welcome the new addition to the Sealink Fleet. m.v. St Nicholas steered into harbour ablaze with lights. The massive vessel steamed up river to dock at Parkeston Quay just after 10pm. Formerly Prinsessan Birgitta she replaced the M.v St. George and the m.v St. Edmund, accommodation was for 500 first class, and 1600 2nd class, the car deck could hold 480 cars and 55 x 15m Lorries. Facilities included, a cinema, roulette and black jack tables ,as well as duty free shopping and Conference areas. 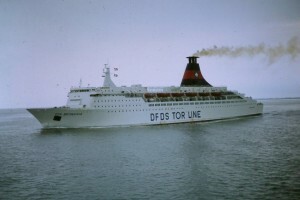 The 1980s saw period of growth for D.F.D.S, with the acquisition of Tor Line and Prinz Ferries in 1981. In addition to the ferries m.v Tor Britannia, m.v. 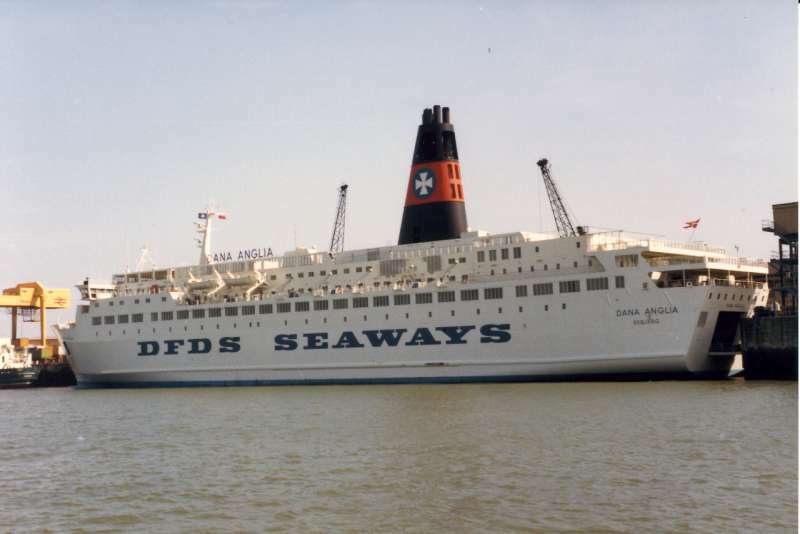 Tor Scandinavia and m.v Prinz Hamlet that were acquired with these two deals, From 1982 to 1983 DFDS’ passenger operations were branded as D.F.D.S. 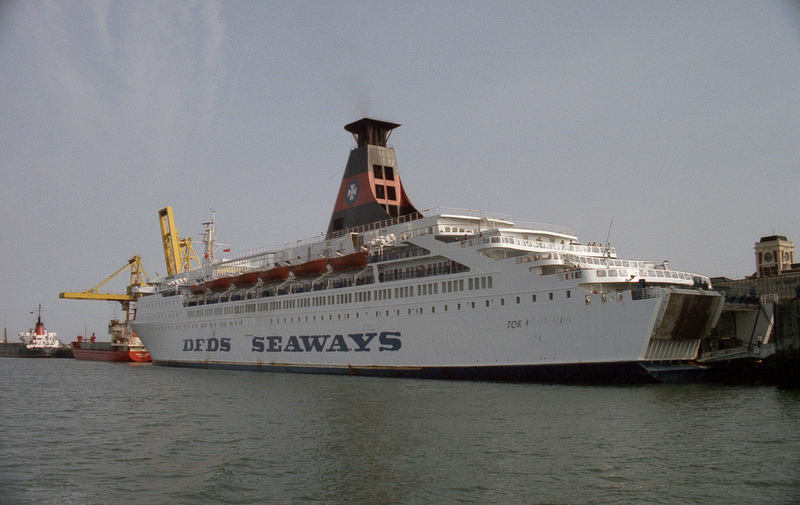 Danish Seaways (Esbjerg—Harwich, D.F.D.S. 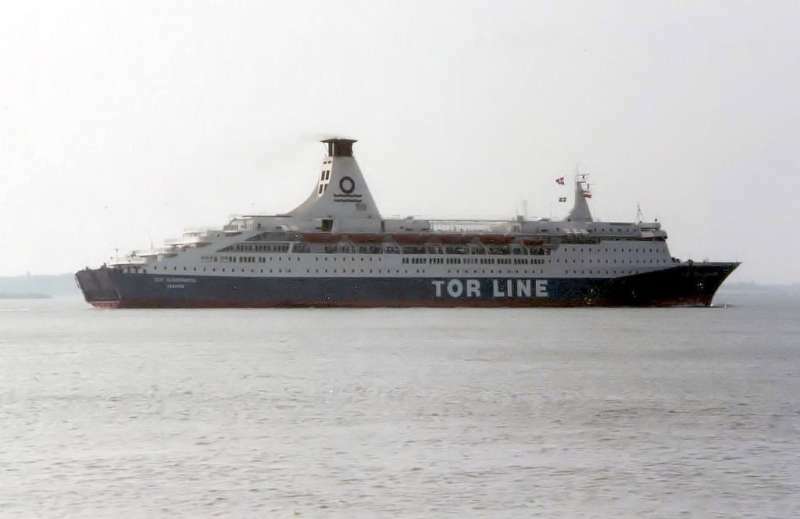 Tor Line (Gothenburg—Harwich) and D.F.D.S. Prins Ferries (Harwich—Hamburg/Bremerhaven. In 1988 the name D.F.D.S. 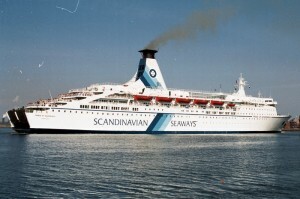 Seaways was dropped from the marketing of the company’s ferry services, which were now rebranded as Scandinavian Seaways. nightclub, Viking Song emerged as Fred Olsen’s new luxury ship ms Braemar, on the 1st of June 1985 , initially set on a route connecting Oslo, Norway with Harwich, her route varied a lot during the next five years, with Hirtshals, Denmark replacing or appearing alongside Harwich as the main destination. at 14,300 tons, she had a capacity for 2,000 passengers and 486 cars, typically Scandinavian; it had an amazing tropic garden lounge, a sauna bath, a swimming pool and its own jogging track. In December 1990 Fred. Olsen sold their ferry operations to the new Color Line, however Braemar was not included in the sale and she was laid up. From February 2012 Regina Baltica served as a floating hotel in Sheringham, She arrived Harwich in the beginning of February. HM Queen Beatrix of the Netherlands launched the magnificent new Koningin Beatrix on 9th November 1985. The twelve-decked ferry was completed on schedule by Van der Giessen-de Noord and SMZ decided that she should sport an all-white hull to match that carried by her British running partner. Instead of Sealink along her hull, the Koningin Beatrix had the words ‘Hook-Harwich ‘on her starboard side, while Hook-Harwich appeared along the port side. Prior to the Koningin Beatrix entering service. The new two-class vessel brought many outstanding features to the route, including a First Class 350-seater restaurant, lounge and bar on Deck 8. The second Class areas on Decks 6 and 7 offered a bar lounge with dance floor and self-service restaurant. Up to 2100 passengers could be accommodated in 1296 berths. After initial problems encountered during berthing, the KB finally entered service on the 22nd of April 1986. 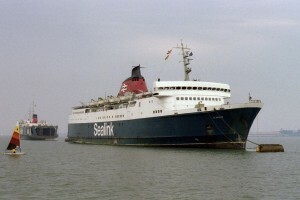 In august 1989 the Crown from the funnel of the Beatrix was removed and painted Stena Line red with the large white ‘S’. 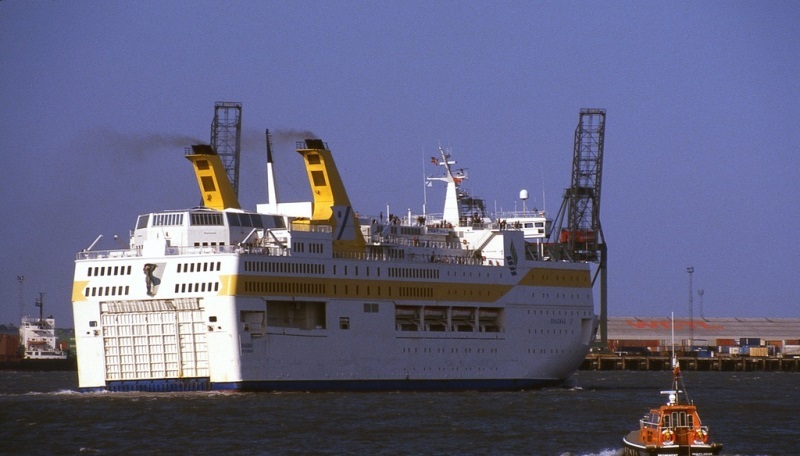 During March – April 1986 the Amorique was briefly used on the Hook of Holland-Harwich service following the final voyage of Zeeland from Harwich on 25th March 1986. Originally constructed in 1972 for Baltic Sea service as Terje Vigen. 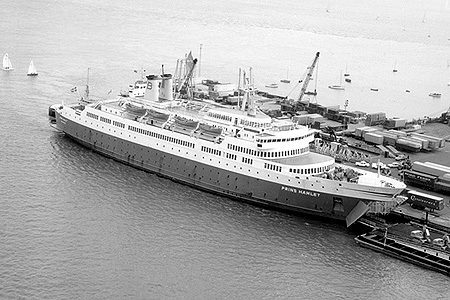 She was acquired by Brittany Ferries four years later for their new Portsmouth/St. Malo crossing. 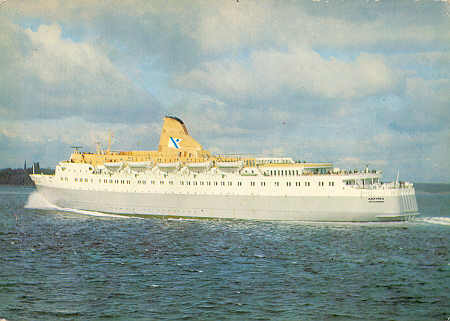 Renamed “Amorique” she went on to launch the Plymouth/Santander service in 1981 and subsequently the company’s link between Cork in Ireland and Roscoff. 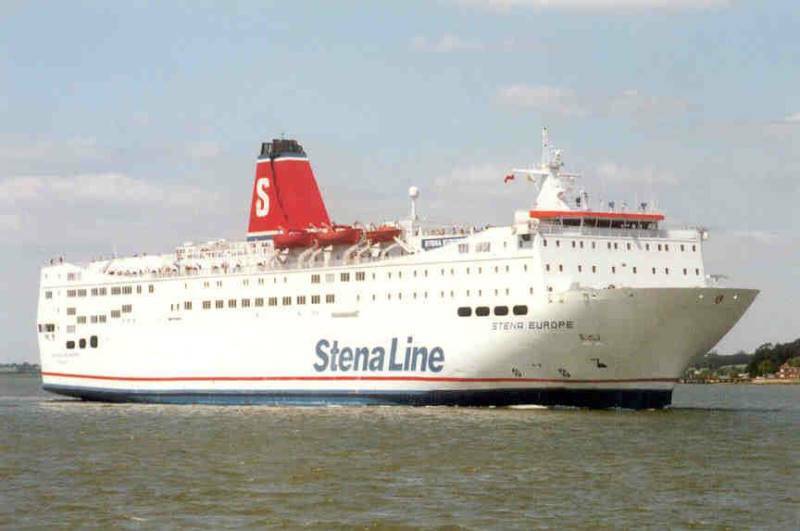 In 1990, when Stena Line took control of the route, the Harwich to Hoek van Holland service was being operated with two passenger and one freight Ro-Ro vessels Stena Seatrader joined the route on the 2nd May 1990, originally built as the train ferry “Svealand” in 1973; the 17 year old ship was a useful acquisition and allowed both passenger vessels to carry more accompanied car traffic in the summer months. Stena Traveler arrived at the Hook of Holland directly from her Norwegian builders on the 28th February 1992. The original idea was that she would replace the Stena Seatrader which was earmarked for a two month charter in the Mediterranean. Engine: four Nohab-Wärtsilä vasa 12V32A diesels; 20, 5 knots, capacity: 2100 passengers, 400 berths. builder: Cammell Laird Shipbuilders Ltd., Birkenhead. On the 19th of December 1995 came an announcement that would later transform the character of the route. 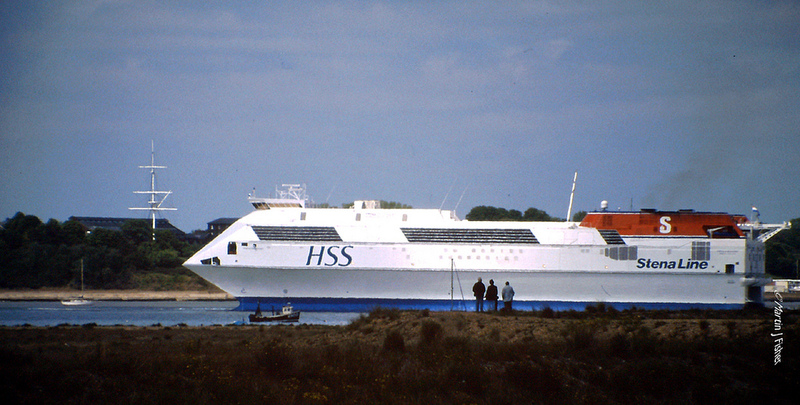 from the summer of 1997, a High-speed Sea Service (HSS) 1500 catamaran would operate as the third such vessel to sail out of the UK. With the opening of the channel tunnel, and cheap airfares holiday trends where changing D.F.D.S had reduced their passenger services whilst Stena line adapted by introducing The High Speed Ship Stena Discovery (H.S.S) which arrived at the newly constructed berth on the 2nd June 1997, the catamaran was 126 meters long with a 40-metre beam, and could carry 1,500 passengers, 38 Lorries and 120 cars. Bringing the new age of fast ferry travel to the UK’s east coast. 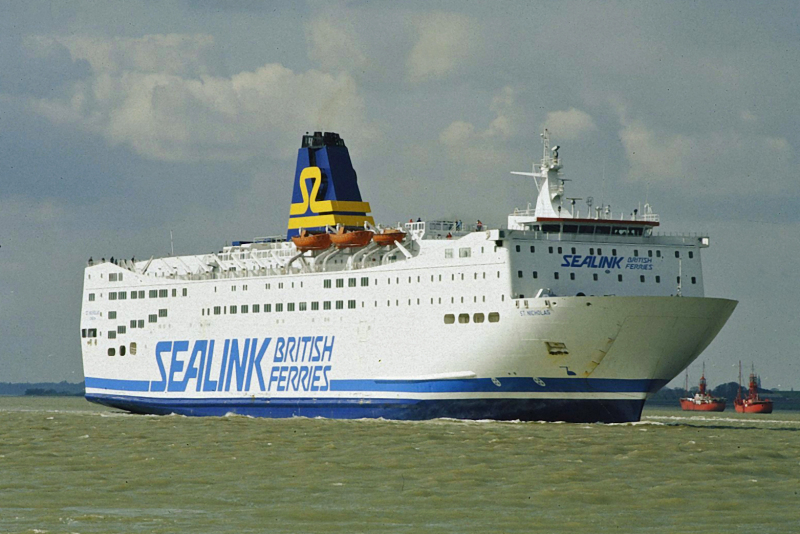 the state of the art vessel, which offered a crossing time between Harwich and the Hook of Holland of just 3.5 hours. The early days of the Stena Discovery were unfortunately hampered by a series of mechanical problems, mainly to do with the water-jets, and spells of particularly bad weather that led to many sailings being cancelled. She also became known as the ‘wave machine’ and the subject of what became a long-running issue over high waves breaking without warning along the coastline. In June 2006, Stena Line announced that the high-speed catamaran ferry Stena Discovery would be withdrawn from service on 8th January 2007. 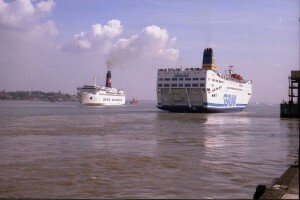 It had been carrying the majority of the passenger traffic on the Hoek van Holland–Harwich route. This service was halted due to the excessive cost of operating the ship and competition from budget airlines. The ferry consumed 180,000 litres of high grade fuel daily whilst doing its four crossings at speeds of up to 45 knots, about 75 kilometres per hour. The St Nicholas was replaced by the 25.905 ton Stena Britannica in June 1991 and In March 1994 the Stena Europe arrived to replace the Stena Britannica, Stena Searider enters service may 1997. To replace the Stena Discovery, Stena Line invested 100 million euro’s in rebuilding the existing ferries of the route. The Ro-Pax vessels Stena Britannica and Stena Hollandica were both lengthened and converted so that they could carry additional passengers. Both ships are now 240 metres long, the Stena Britannica being lengthened by 28 metres and the Stena Hollandica by 52 metres. The Stena Britannica returned to service on 12 March 2007 and the Stena Hollandica on 14 May 2007. 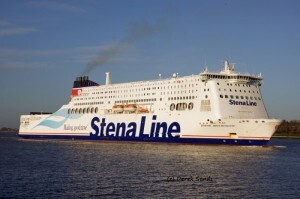 To meet increasing demand on the Harwich – Hook of Holland route, Stena Line invested over £375 million in two brand new Super ferries. The Stena Hollandica launched on the 16th May 2010. The Hollandica’s sister ship the Stena Britannica launched on the 9th of October 2010. The new Superferries offer 30% more capacity and exciting new facilities for passengers and cars, giving travellers even more space to unwind. Each Superferry has 5.5km of car deck space, can carry 230 cars, 300 freight vehicles and offers 1,376 beds on board in 538 cabins. Facilities include buffet and a la carte restaurants; two bars; children’s playroom, teenager area; cinema; and, media room filled with magazines and newspapers; a news room where you can keep up with the latest local and world news, an internet corner and free Wi-Fi. Throughout the 20th century and into the 21st, Parkeston Quay (Harwich International Port) has retained its close ties with Europe, with ro-ro ferry links for both passengers and freight to ports in the Netherlands, Germany and Scandinavia. It has also diversified and today’s activity encompasses liquid and dry bulks, general cargo, containers and a thriving cruise business. “A Sad Day” at 1715 hours Sunday 28th September 2014 the Sirena Seaways left her berth at Parkeston Quay for the last time. there was still a silence as the crowds headed home to reflect on what was a sad day for the people of Harwich. After 140 years Two World Wars and many incidents, this was the end of an era. The past one hundred years have brought about incredible changes in the shipping industry what will the next 100 years bring ? We hope you will enjoy browsing these wonderful photographs of Ships Past & Present. Acknowledgements: The Harwich Society, Derek Sands, John Wray, Simplon postcards.